Blackmagic Forum • View topic - Blackmagic Pocket Cinema Camera 4K!!! Blackmagic Pocket Cinema Camera 4K!!! Last edited by Gene Kochanowsky on Tue Apr 10, 2018 8:45 pm, edited 1 time in total. Re: Blackmagic Pocket Cinema Camera 4K??? I know. I hope it's not a hoax or a costly prank. That BM is announcing the camera and that it is shipping now. It would be validation that we are seeing a new BM. I'm worried about the sensor. The old one used in the microstudio has been updated before, and the latest series is better. But, it seems unlikely they would use an older in the broadcast than a pocket. But what is in the broadcast. They do 4.6k version for years too. Also, after all these years, a 4.6k version for better 4k delivery is also desirable. Wayne, Captain Hook has already ststrdmthr Broadcast Camera has the same sensor as the Micro Studio Camera, but with better cooling and a improved video,processor to push that sensor to its limit. Doubt very much they used this same sensor in the new Pocket 4K Camera. BM stated last year they were looking for a new 4K sensor for a Pocket 4K Cinema camera. Maybe it's a Sony sensor with BM color science and 4:2:2 [10bit and] 12 bit raw? Could be a game changer. Last edited by Gene Kochanowsky on Sun Apr 08, 2018 10:31 pm, edited 1 time in total. Man I hope that’s real. 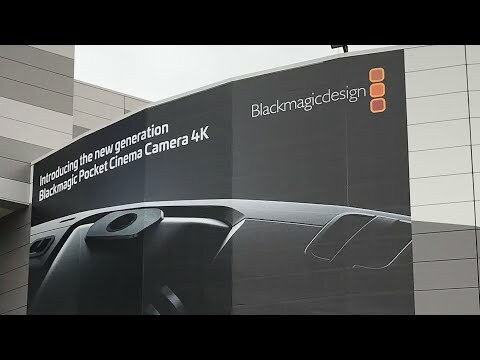 Blackmagic Pocket Cinema Camera 4K??? Last edited by rick.lang on Sat Apr 07, 2018 3:52 am, edited 1 time in total. (4:4:4) CinemaDNG 12 bit raw or ProRes raw/HQ? New camera so heck, why not a new codec? Last edited by rick.lang on Sat Apr 07, 2018 3:53 am, edited 1 time in total. Depends on if it records on SD cards still, or Cfast cards. If SD Cards still, then problably ProRes RAW. Touch screen on the rear with UMP style menu? And what is everyones guess on the battery? Well, BMPCC4K means that either there exists a storage medium 4 times faster than BMPCC storage medium (Sandisk Extreme Pro 95 MB/s), or there is some algo for near-lossless compression of raw 4 times more efficient than current one, or the camera is PRORES only (no raw), or there is some H.264 or similar codec. This also requires some advances in video processing DSPs. While I believe it's unlikely that BM moves from Spartan FPGA to some ASIC it's at least possible since at least Z Cam E1 used a purchased sensor and processor. Well, considering it’s still called a Pocket, the battery is gonna be a small one. I just hope it’s bigger then the Nikon ones, and lasts longer then 20 minutes. And man I hope the screen flips out, the touch. I would be fine if it had all the quirks of the original pocket, poor audio, poor display, poor battery, no auto anything, but everything else the same except 4k. If it's the same price and the image quality is there, I'll order one in an instant. Hey! How did I get over there with those glasses. I'm so confused. Can you get a telephoto out and snap come of the darker areas of that poster please Dimitry? Chris Chiasson wrote: Depends on if it records on SD cards still, or Cfast cards. If SD Cards still, then problably ProRes RAW. Wouldn't the data rate be too high? Wayne Steven wrote: Can you get a telephoto out and snap come of the darker areas of that poster please Dimitry? Anatoly Mashanov wrote: Well, BMPCC4K means that either there exists a storage medium 4 times faster than BMPCC storage medium (Sandisk Extreme Pro 95 MB/s), or there is some algo for near-lossless compression of raw 4 times more efficient than current one, or the camera is PRORES only (no raw), or there is some H.264 or similar codec. Sony and others has released 300MB/s cards in SD format. And UHS-II maxes out at 312MB/s.. UHS-III goes to 624MB/s on SD.. but I don’t know of any UHS-III cards yet and therefore no interface for it. But with the addition for ProRes RAW. This could easily be doable. Well, it sure isn’t recording to a 2.5 SSD, unless the Pocket name is just branding. And the original 1080p Raw formate ate 64gb SD cards big time, so they definitely aren’t using CinemaDNG Raw for 4K if it does support SD Cards. That’s why I’m assuming ProRes Raw, since it takes up half the space of DNG, and if the ProRes Raw paper is correct, half to a quarter of the datarate of DNG. Otherwise, Cfast cards. It’s all going to be okay Monday morning my friends. With the new Prores RAW codec, it look really interesting !!! Damn, a sister to the most famous BM camera is on the way... Can't wait to see that ! For sure another game killer from BM if we know what they already did by the past. Lol, I sort of guessed that guy's name might not be Dmitry. I was going make a joke about how you got back so quickly if it wasn't you. You do a really good American accent and you look just like the DSLR Shooter guy. Many support producer develop 300mbits sd to support different cameras, first search born with gh5 with 400 intra 10bit 4:2:2. I can record by va4k on San disk extreme sd 95mbits a uhd prores from sdi or hdmi. Already stated elsewhere, $995 or $1295, sounds like two versions? So did anyone hear anything about the sensor size? S16 or MFT? If it doesn’t have 60fps (@4K) and at least decent lowlight (gh5) it’ll be a shame. However, I’m hopeful because I think BM knows that is the current bar for the pocket camera market. Denny Smith wrote: Already stated elsewhere, $995 or $1295, sounds like two versions? I hope you're all wrong (about price). Anyone who's struggled with the Pocket isn't likely to want the same struggle with the new camera, only at 4K. Good screen, EVF(? ), better controls, minimum 90 minutes battery life, bigger body as needed? All that costs money. We're gonna need bigger pockets. Last edited by Dan Keeble on Sat Apr 07, 2018 7:46 pm, edited 1 time in total. Dan, Photobucket does not work here, you need to post the image directly. Dan Keeble wrote: We're gonna need bigger pockets. Hopefully not much bigger wallets. I still am not fully convinced we're seeing real images and not "fake news," but it does sound like there have been independent confirmations from some reputable sources. The good news for those of us who are happy sticking with HD is that there will be a ton of used original pocket cameras on the market at very good prices once this new one comes out. I might buy one as a backup! John Paines wrote: I hope you're all wrong (about price). Anyone who's struggled with the Pocket isn't likely to want the same struggle with the new camera, only at 4K. Precisely and why I never bought the original. It was and is totally useless and a documentary film camera unless rigged to within an inch of it's life and that simply defeats the purpose of it in the first place. If this new camera is self contained, along the lines of the Digital Bolex with say, an EVF and 'universal' or MFT zoom lens mount, I would buy several even if they're priced around $3-4K. Odd as it may sound, not everybody shoots staged, dialogue driven drama. The Pocket always had an active MFT mount on which MFT zoom lenses could be used without any problems, with lens stabilization being supported by the camera. Too expensive. 4kp30 give it a break BM. BM has had great success with the BMPCC, which AFAICT, was never intended for anything else but shooting narrative. Now maybe they will give it more documentary and run-n-gun features, but I don't think so. My guess is, it is intended for the same users that bought the original. Not a whole new group of users that don't really want to shoot in raw. There are plenty of entry level UHD cameras that serve those other markets. But there is nothing for cinema cameras that shoots raw with that resolution at that price point. And that is just the sort of market segment BM would go after. They like to change the game, not play the same old game. You're right. They're calling it a Cinema camera so it's not likely to be suitable out of the box for Doco use. Pointless to argue over a camera which must already be in production, but it's hard to see how the BMPCC's operational shortcomings are particularly "cinematic" or well-suited to narrative work The best you can say is, you're prepared to work around its limitations or rig it at 20x its original size. Not fixing the easy obvious stuff 5 years later would be a novel manufacturing strategy. Gonna assume this picture is fake till we see one where the quality is better. The quality of that picture shouldn't be that bad, considering people who use $5000 worth of equipment is going to that show. Interestingly, that looks MFT (or Fujifilm X), the three recesses being in a "vertical" Y shape, as opposed to 30° rotated Y, like Canon EF and Nikon F, or upside-down Y like Sony E. And if MFT, there seems to be a Super 16mm sensor inside. Now the Pocket/Micro Cinema's Fairchild CIS 1910 achieves its dynamic range with a 6.5 µm pixel pitch (basically what would have been a Super 35 sized 4K sensor, cropped to 2K), and 1.2 e- readout noise (modern Sony STARVIS is ~ 0.8 e- at high gain). Now the mystery is, how do you make a 4K Super 16mm sensor, with 1/4 the pixel size and full well capacity, and say 50% better SNR, not still 1.5/4 ~ -1.4 stops lower in dynamic range? Does this camera/sensor combine multiple EV (spatially, like Fujifilm SuperCCD SR, or temporally, like RED HDRx)? Yue Shi Lai wrote: Now the Pocket/Micro Cinema's Fairchild CIS 1910 achieves its dynamic range with a 6.5 µm pixel pitch (basically what would have been a Super 35 sized 4K sensor, cropped to 2K), and 1.2 e- readout noise (modern Sony STARVIS is ~ 0.8 e- at high gain). Now the mystery is, how do you make a 4K Super 16mm sensor, with 1/4 the pixel size and full well capacity, and say 50% better SNR, not still 1.5/4 ~ -1.4 stops lower in dynamic range? Does this camera/sensor combine multiple EV (spatially, like Fujifilm SuperCCD SR, or temporally, like RED HDRx)? For now, we have every reason to assume that the camera uses the 1" 4K sensor of the Micro Studio Camera. I hope it's an S35 with an active EF mount. S16 and MFT mount were great for the original but we are passed that S16 look, particularly with 4K. But really, most people buy a metabones SB just so that they can use their EF lenses on the original. Till Monday then.